It's Friday, time for another update. Next week we have a new batch of avatars for you to find and collect. Also Tom has been working hard on improving the messaging system on the accounts. It's looking snazzier than ever with a bunch of new features! We aim for this to be released later next week. 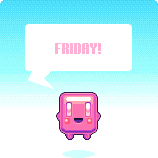 Of course there will be another Pixel Love treat for you as well on Monday. We are always looking for ways to enhance the accounts and user experience, so has any body got any suggestions for things they would like to see improved?